Photojournalism. The ability for a picture to tell a thousand words. 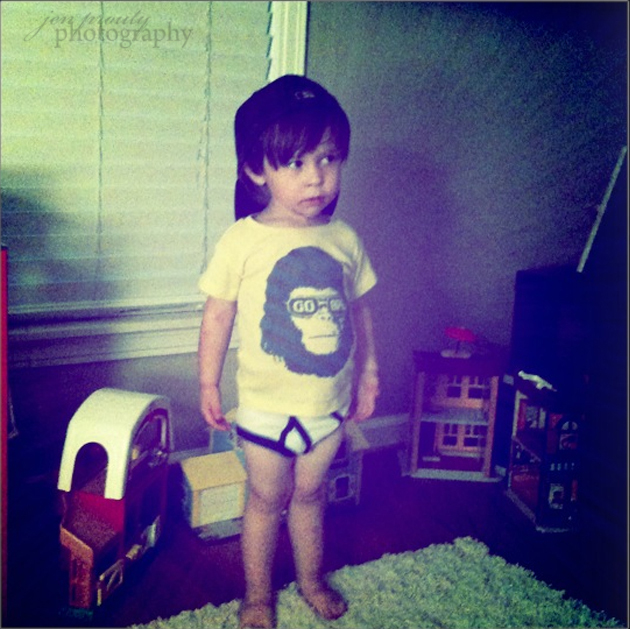 This is a picture of my son on his first day of potty training in his big boy underwear. We are now at day 40-something of potty training but that is another story for another day... Someday he will probably hate me for posting this on the Internet but I love it. I love how big and little, old and young he looks...all in one photo. I love in the background his fisher price toys are lined up right next to my fisher price toys that I used to play with as a kid, now his. Old and new, co-mingling in play. I love the naive feelings I had this day thinking potty training was going to be easy...quick...the word fun might have even crossed my mind. I cherish this photo because my rose-colored feelings of potty-training, many days later, seem to have faded. This picture brings me back to day one and gives me hope. I guess I should shut up before I ruin the other 875 words my photo has to tell you. Taken with my Iphone. Giving my canon a break. 100% cuteness! What a great photo for him to look back upon. Great shot/capture. LOVE IT!!! This will be a shot for the wedding reception slide show. :+) GOOD LUCK TO YOU BOTH! Ha!!! Love this one!! Too cute!